It only takes a snapshot to remember the day. It was freezing cold, with bad winds and temps in the low thirties. The first blizzard of the year passed over us as we hunkered down in Mott, ND with lots of howling wind and snow that blew mostly sideways. When the sun returned two days later, the roads stayed frozen, but the birds came out to eat. 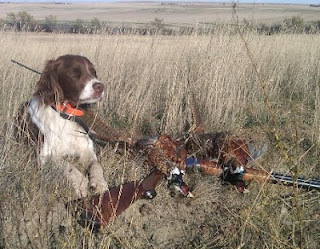 We caught these boys in an area of tree rows and CRP surrounding a lake (public land). Ace knew the plan and I was right on with the gun. We worked the treeline, seen in the background, which borders a cut wheat field. It wasn't long before his Garmin pager went off and I moved up the outside of the row. Brush moved and red and white flashing color started left and emerged right in front of the gun. One down. We started up the hill to the truck, through the CRP, and Ace locked down again. I kicked up the second rooster and bagged it. I noticed his retrieve wasn't nearly up to his standards on the second one, so I grabbed his collar to check him over and noticed five porcupine quill on the side of his muzzle. Evidently, he hit Mr. Porky a glancing blow while scenting the rooster in the wood line. 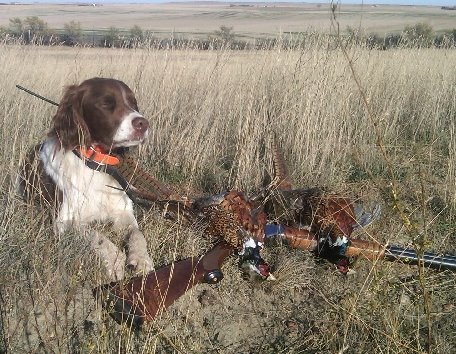 I've seen that before with hard charging bird dogs. I'm darn thankful that's all it was.